A few weeks ago I painted a chair. It was seemingly a very fine chair. But there was this stain on the seat. It wasn't all that visible. But it wasn't to my taste. Nor anyone else - since it was still there with 5 minutes to go at the estate sale and I bought it for $10. Of course, it went into a stack in the garage. So far this year I am sticking firmly to my resolve to not buy anything until we can park two cars at least one car in the garage. Two cars would be - well, rather optimistic. I had a bag of Miss Mustard Seed Milk Paint in Linen. I remembered really liking the color when I used it for the undercoat on this dresser. So I mixed it up. 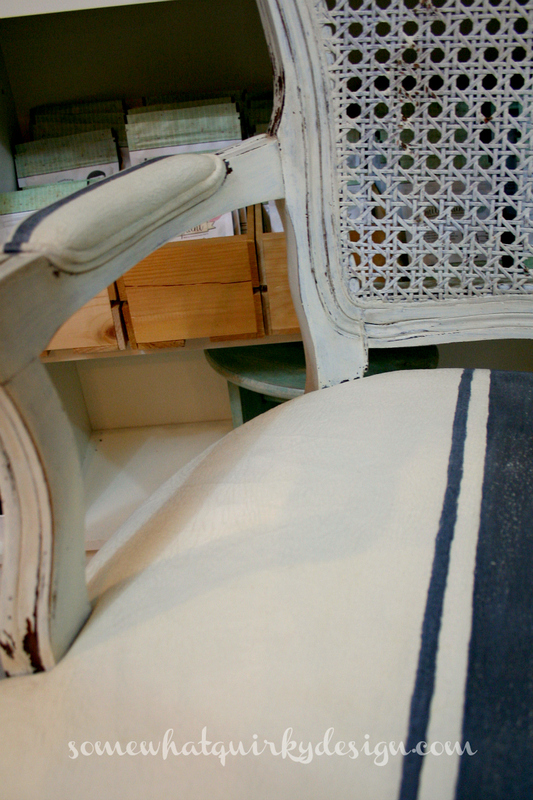 This chair had a modern finish on it which I knew wouldn't respond well to the milk paint so I lightly sanded it. I probably should have sanded it more. It shed flakes quite aggressively. More than I had hoped. So I just added some more chips and distressing and went with the well worn look. That's the deal with the milk paint. It chips when you don't want it to and doesn't chip when you want it to! I did want it to chip a little or I would have used bonding agent. Then I used most of the rest of the paint to paint the upholstery. I didn't really follow any fabric painting rules or anything. I basically just kept the paint rather thin for several applications then let it thicken for the next several coats. Then I painted some grain sack stripes on the arms and down the center of the seat. 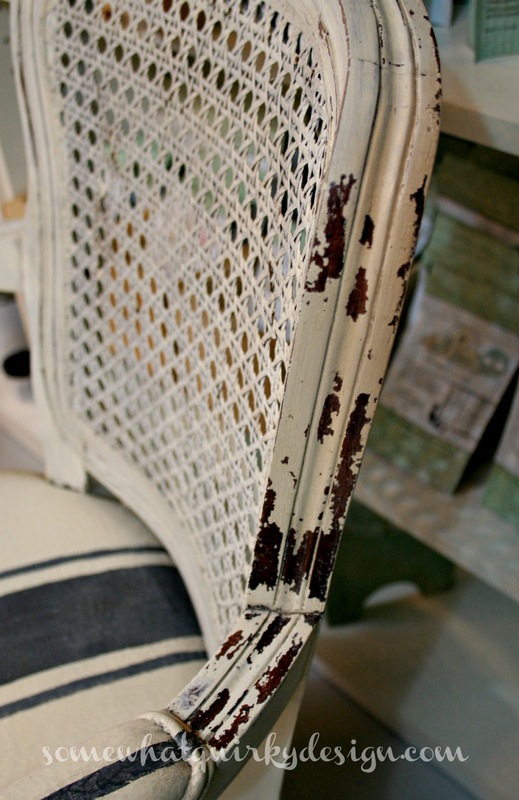 If you look closely at the chair you can see where the paint crackled. I figured this would happen because the chinz fabric was very thin and there was not much there to absorb the paint. This would actually be quite lovely with one of the darker colors as it looks a LOT like leather. 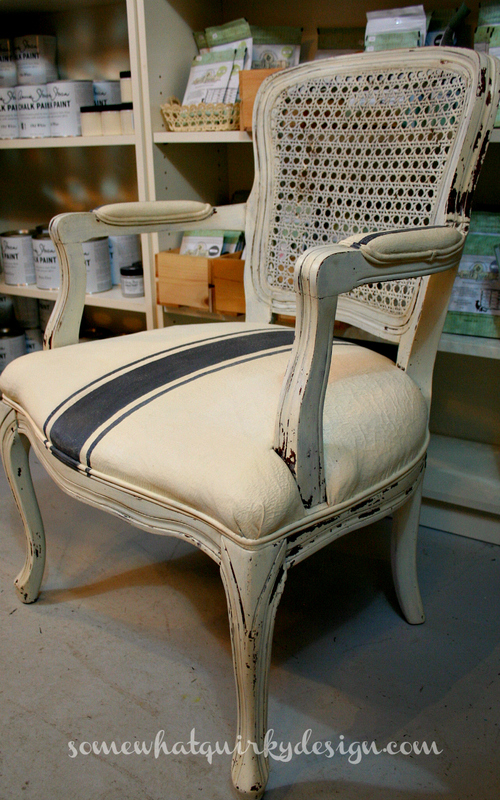 I sanded and waxed the fabric, then waxed the remainder of the chair with Miss Mustard Seed Furniture Wax. I also used Miss Mustard Seed Antiquing wax - fairly generously over the wood parts and a teeny tiny bit on the arms where they would have gotten dirty. 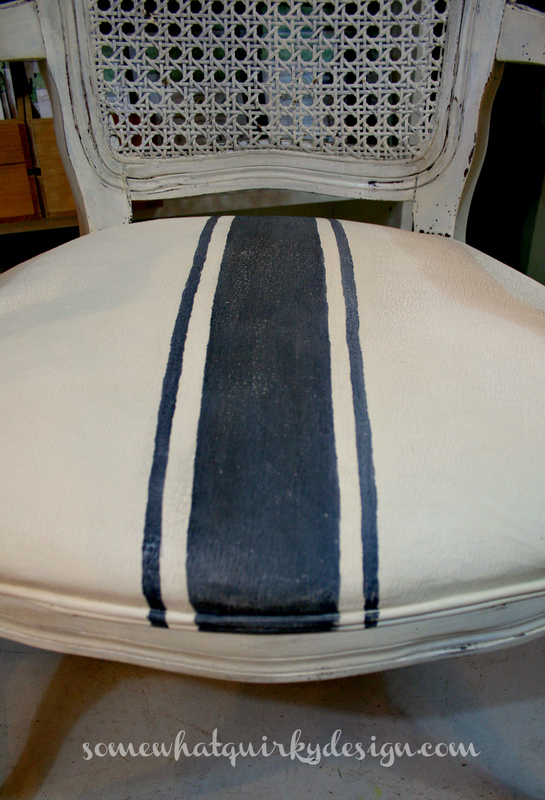 As I look at this picture I remember that I waxed the fabric prior to painting the stripe. 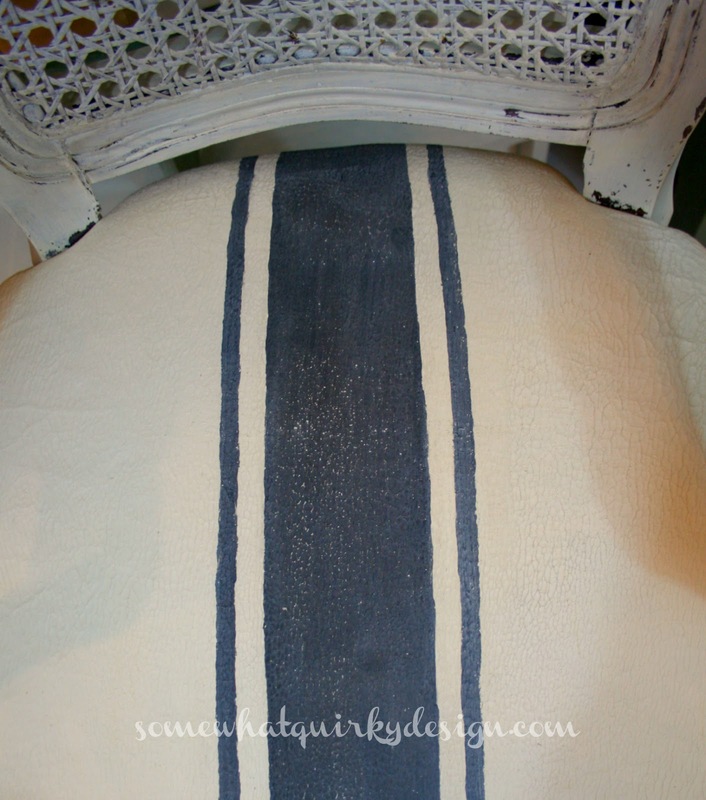 Did you know that painters tape does not stick to waxed fabric? I would call that a tip, but who else would be dumb enough to expect it to? It was somewhat difficult to paint a straight line on the crinkled paint finish. I'm telling myself that it looks more woven that way. Look how straight it looks in this picture! It just needs a place to live. It looks wonderful, Karen! 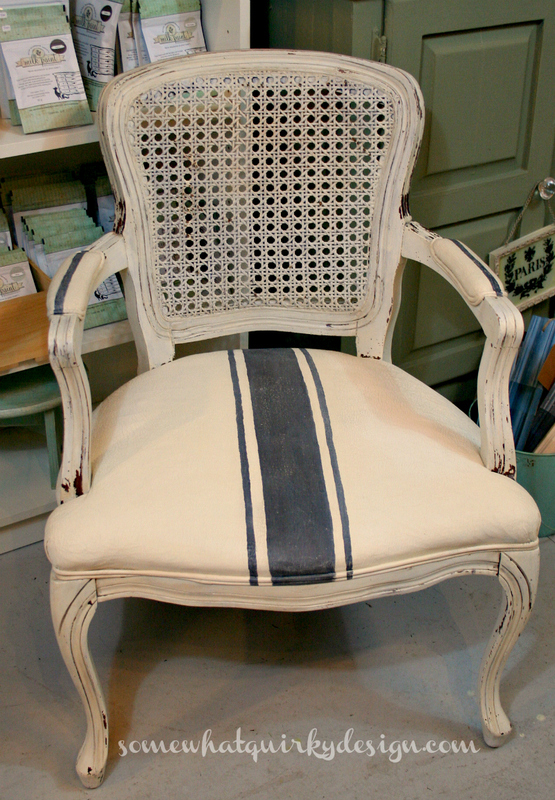 You used MMS Milk Paint on the fabric, too? Who knew?!! I've painted fabric... but didn't wax it. I didn't use MMS either... I used Ooops! paint. another Question: IS it a TWO car garage? I only ask...cause I worry about you! The chair looks great. I have a rocker with a 'sculptured velour' seat that is a very unattractive green color. Do you have any insight on how well textured fabric would take paint??? The wood part of my chair is flawless, the fabric - not so much. 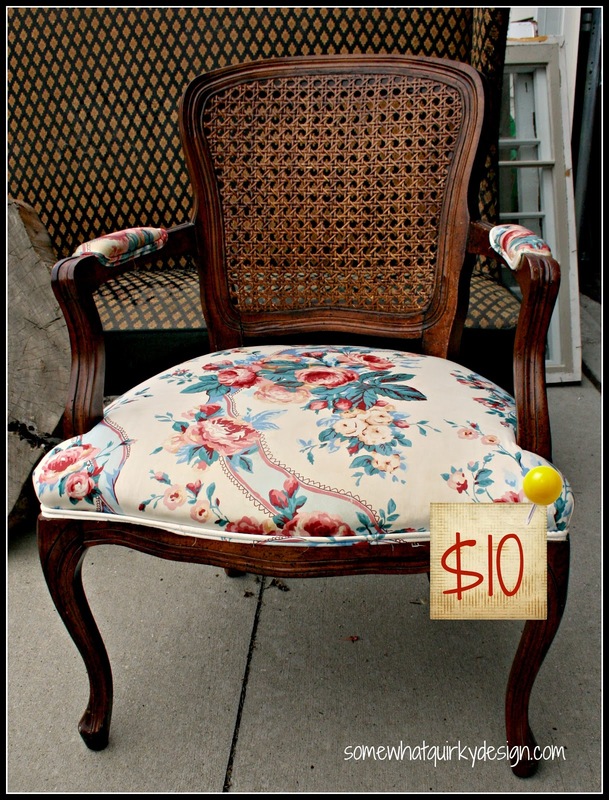 THat chair looks lovely and I bet someone buys it pretty quick! I would probably not have thought about the wax/tape thing either. Oh I would have bought that chair also. I can't believe that chair only cost $10, what a steal and now you've done a makeover on it, it looks absolutely gorgeous, great job Karen. I love the chair! Inspires me to paint the one I've got that needs some attention!